Days after the Easter miracle that saw an American sea captain rescued from the Somali pirates that are terrorizing the gulf of Aden, a Greek-managed ship by the name of MV Irene was overtaken early this morning. Early Reuters reports indicate that the 22-member is safe, but prayers go out to them and their families for a peaceful resolution. Somali pirates vowed to increase the level of violence against hostages after the rescue of the American captain over the weekend. Does increased pirate activity mean that shipping companies should consider arming commercial fleets? 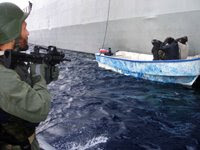 While Somali pirates are reportedly armed with AK-47s, would they be less apt to succeed if Blackwater-like security firms served as armed security guards of the seas?